Tall flowers aren't as popular here either. We assume it due to the winds we can get (they topple over) or peoples obsession with their landscape looking neat and tidy. Your Liatrises are definitely popular in your garden...well one of them anyway. I think many people have the idea that trees should be tall, shrubs should be medium height, and flowers should be short, and they are not sure how to landscape differently. I do see people here sometimes growing tall clumps of those mammoth sunflowers, though, which are so awesome. I can see not wanting to grow tall flowers due to strong wind, though! What a difference a change of Liatris makes! It's wonderful to see a plant of value to pollinators and birds. The more commonly sold Liatris is native, so I'm sure it must provide some value, especially in the wild. In my garden, though, it just doesn't have nearly the appeal as my other plants that are in bloom then do! Fall is my favorite time of year, so I am enjoying it! I hope the same to you, Beth! 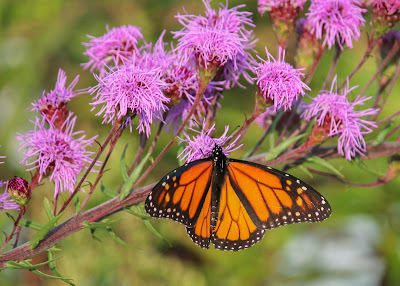 I also have planted the Gayfeather liatris. 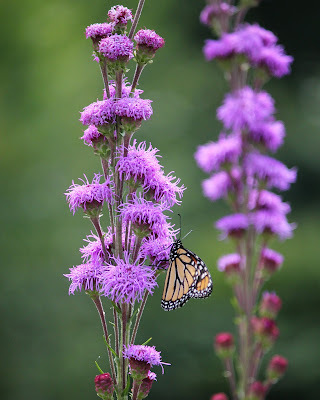 This year I was in a hurry and bought a liatris but didn't know until it bloomed that it was Liatris ligulistylis (did I spell that right?). I am very happy with it and hope it spreads a little. I hope it attracts a lot of pollinators for you! So glad you posted about this - I've added it to my must-have list! 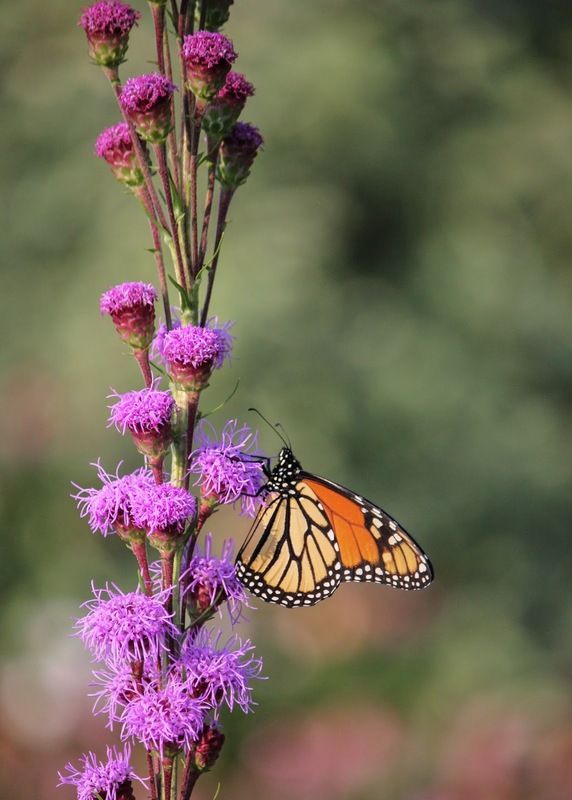 Oh good, it really is a wonderful liatris - especially when covered in Monarch butterflies! I'm going to have to try that one. I've heard good things about it, and it's lovely, too. Great captures of the butterflies! Thanks! We are so thankful we've gotten more Monarchs this year. To see even a small number in one place is very rare here now, unfortunately. 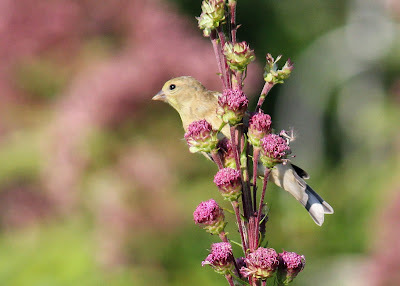 I love that Liatris ligulistylis attracts both monarchs and goldfinches. What a great plant! I was not familiar with this one. Thanks for the very helpful info! Sure! I think you are on the southern range for this plant, heat zone wise. It would be interesting to know how well it would do there. Good to know! 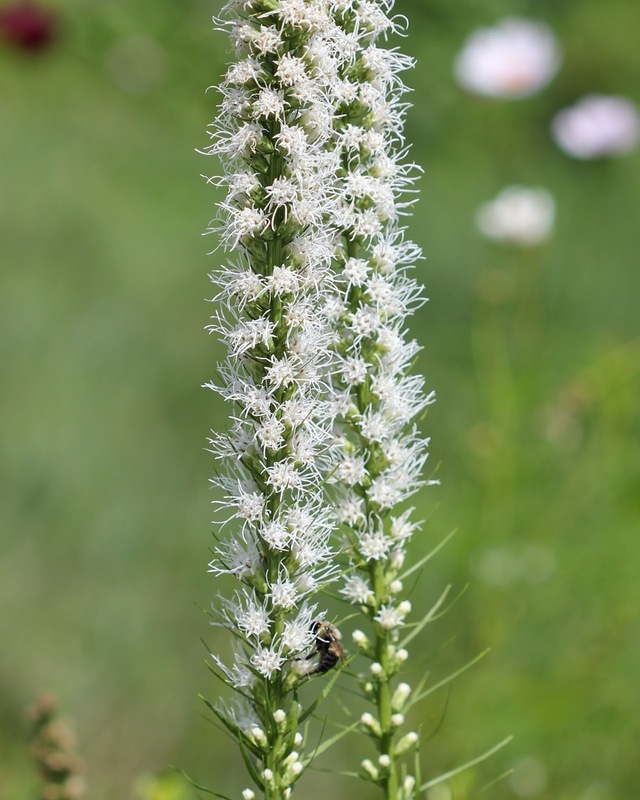 I've always assumed the liatris the lists were talking about was the first, as well. I will have to keep an eye out for this variety. I always thought the same! Maybe it attracts more pollinators in other gardens where there isn't so much blooming at the same time like in mine. 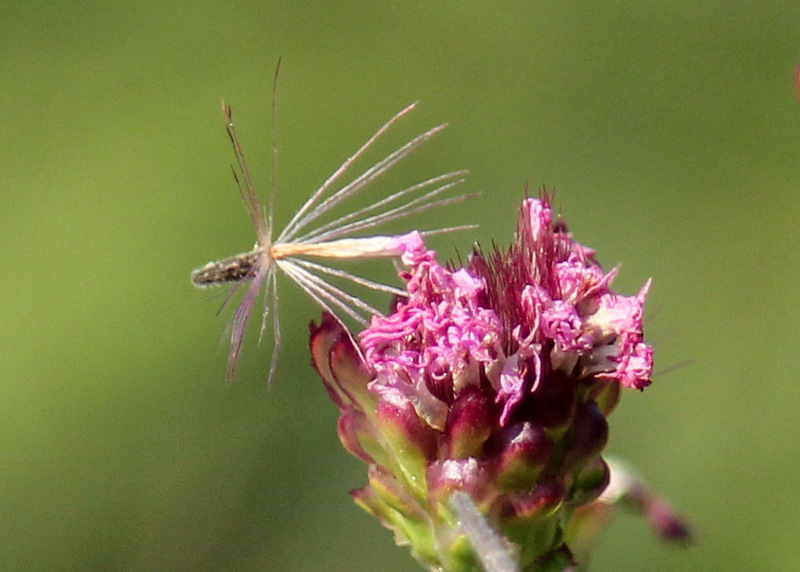 I have not had good luck with Liatris. I do need to try the ligulistylis, though. 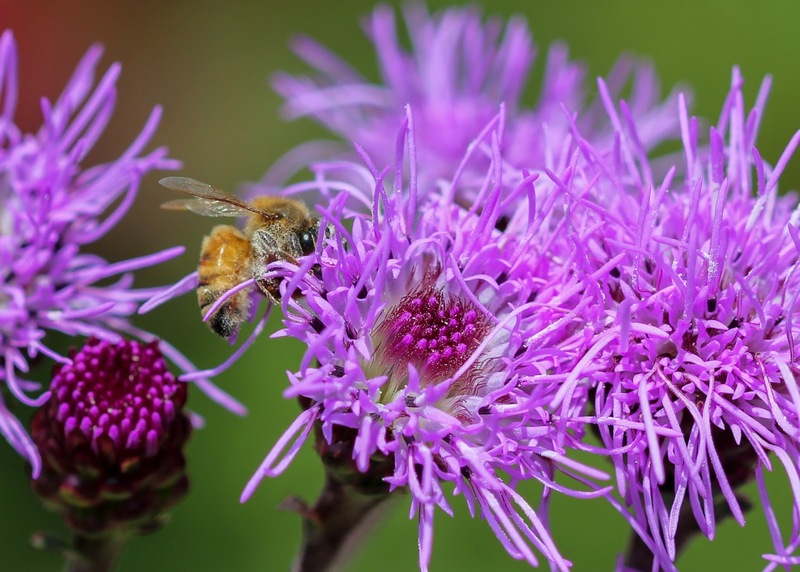 There are actually several different types of liatris, and some do better depending on the type of soil. 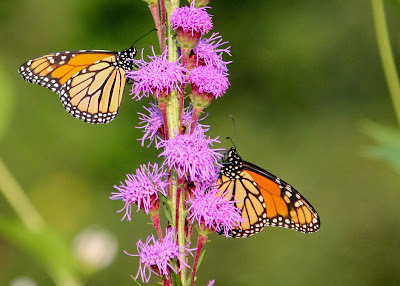 There are a couple others that I've seen that also have a better reputation for attracting butterflies than the common spicata one does. 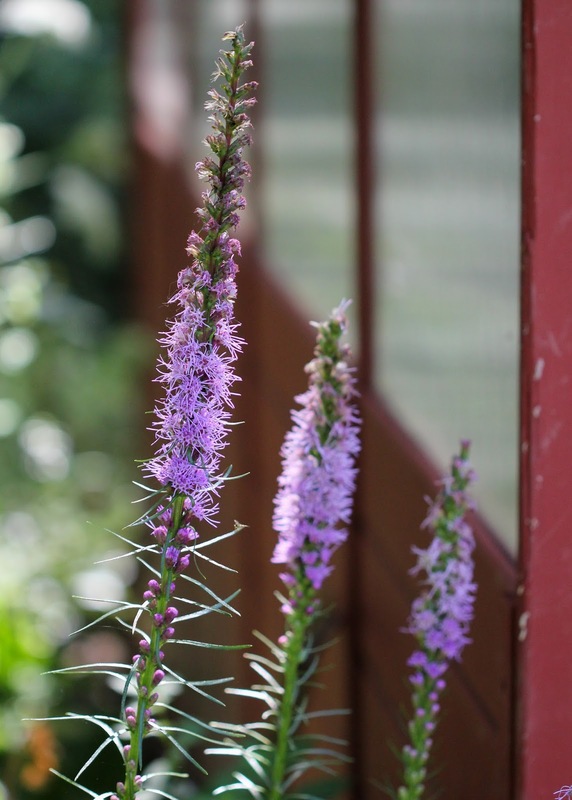 I was not overly impressed with Liatris when years ago I grew the first one you described. 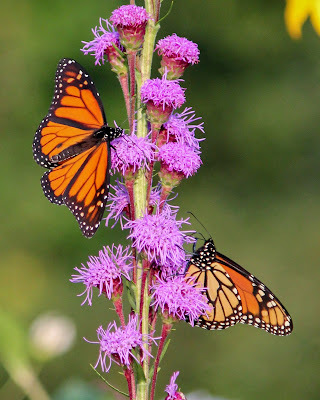 Thanks for the introduction to Liatris ligulistylis. It sounds like a winner! Definitely a winner in my garden! There are a couple other types of liatris too that have a better reputation with pollinators than the common spicata one does. I think nurseries should sell more of these types! I had the same problem with liatrus and boy when I planted both, the monarchs certainly set me straight....I do love both in my garden....great photos. The monarchs definitely have a preference! 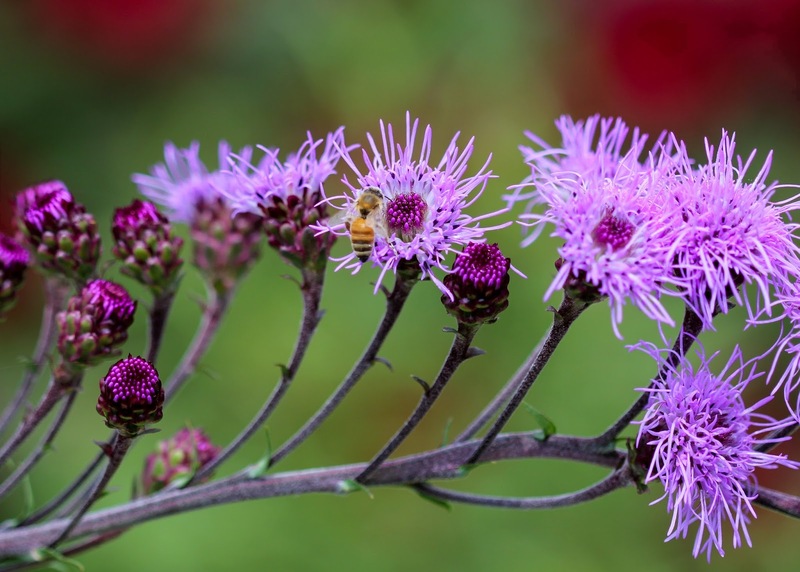 The common spicata one really is lovely in the garden, though, which is probably why it is more commonly sold. I kept trying to leave a comment. Nothing worked. I don't understand what has changed. I grew Dense Blazing Star liatris for the first time this year and I was not happy with it. The bloom stalks were 3-4 feet tall and toppled over. Now that I have learned the critters have no interest, I'm done with it. The other variety doesn't grow in my neck of the woods. 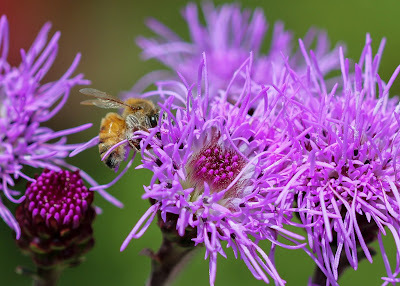 I bought a couple of new liatris this spring but did not look carefully at the label. I was shocked and delighted by the L.ligulistylis!